Works with: 3DS Software compatible devices, New 3DS & Above recommended. 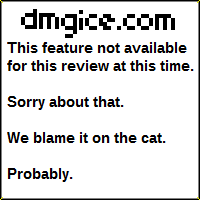 Disclosure: This game was provided by Image & Form via a review code. 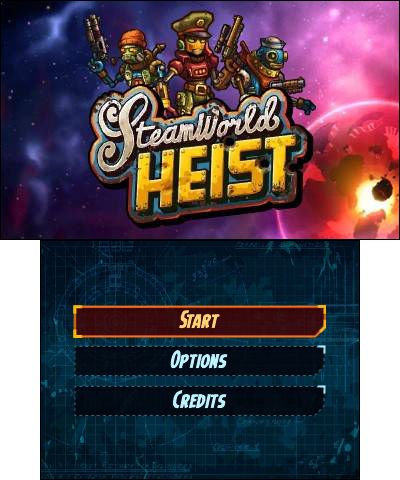 After the successful and interesting SteamWorld Dig, Image & Form announced the third SteamWorld Universe game: SteamWorld Heist. This time, the Earth has been destroyed and all of the Steambots live in space. Water is the most important resource out there and there are many different factions out there. Outlaws, Moisture Farmers, Scrappers, the diesel powered Royalists, and other types of robots make their homes among the stars and pieces of Earth. One of the more rag tag bands of Outlaws is run by Captain Piper Faraday. The Scrappers are muscling into her turf and she has to do something about them! 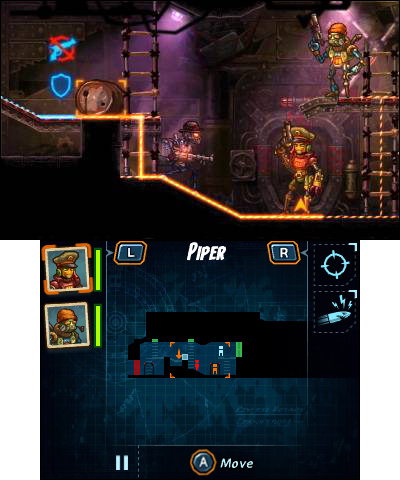 An interesting thing about the SteamWorld series is that each game seems to inhabit a different genre. 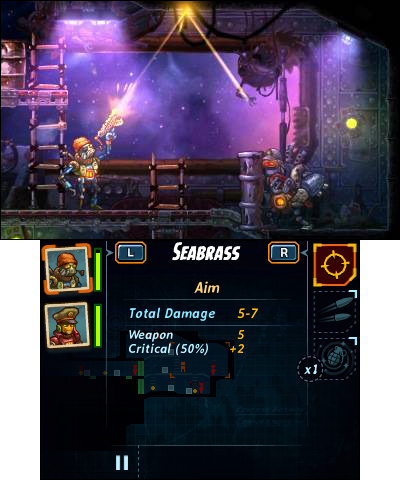 SteamWorld Tower Defense is Tower Defense, obviously. 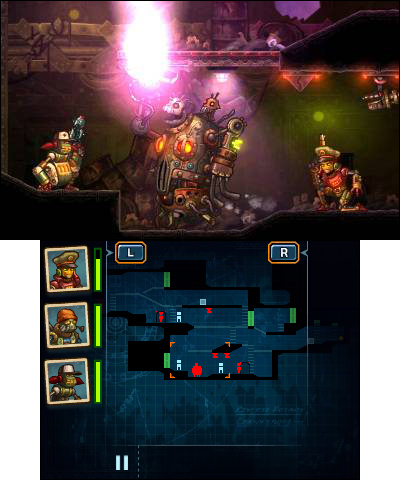 SteamWorld Dig is an exploration style platforming game. 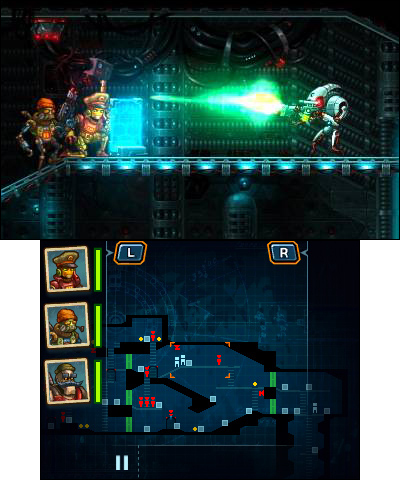 SteamWorld Heist is a side view, turn based strategy Role Playing Game. I am a huge fan of Strategy Role Playing Games like Final Fantasy Tactics, Fire Emblem, or Codename: S.T.E.A.M. and I admit that I was a bit skeptical of the idea of a completely two-dimensional SRPG. Did Image & Form succeed in their unusual gamble? This game reminds me a bit of Worms and Side Pocket Pool for the NES. Each character has a set amount of spaces along a two dimensional grid that they can move to per turn. The movement grid has two colors indicating how far you can move and still fire and where you can "sprint" to without firing your weapon. You can equip your character with one weapon that matches up to their "skill class" and two items that can add extra attacks, extra statistical enhancements, healing, and other unique abilities. Each character also has a set "skill tree" that unlocks when you level up from completing a mission. You gain experience from finishing mission objectives and not from defeating enemies. Many of the map layouts are procedurally generated, so going back into a mission to improve your score, try a higher (or lower) difficulty level, and grinding for experience is always a unique experience. Upon completing all of the objectives in a mission, you have to evacuate to get back to your ship. You can also customize your characters with a collection of hats (FINALLY!) that you can either purchase or shoot off the heads of your enemies. A normal turn in the game includes moving to a place behind cover, aiming your weapon at enemies and firing at them. Your bullets bounce off of certain objects and walls, so you can "aim around" to hit enemies with the ricochet. Some weapons even have piercing bullets, so it's possible to kill multiple enemies with one shot. During playing, I actually killed three enemies in one blow using one of the stage hazards that explodes when you shoot it by bouncing a bullet from behind them. In many levels, there is an "alarm" count down which causes enemies to spawn endlessly. Since you do not gain experience from killing enemies, often a typical mission is a strategic race to escape with "Swag" without getting horribly killed by the enemies. Especially when Turrets start to show up. There are a lot of levels to explore in this game. It would be a bit of a spoiler to say how many of them are there. When you beat a level, you get stars based on your performance and how many of your crew members are still alive at the end of the mission. Penalties for dying, aborting a mission, or getting a game over depend on the difficulty settings and feel evenly balanced. The storyline of the game is presented visually in voiced "picture rolls" and by in-game dialogue between characters. All of the characters, even the the one who only says "Blub," are reasonably fleshed out and interesting. The storyline has some great call backs to the previous games: Dig and Tower Defense. The script in this game is pretty fantastic too with interesting puns and item descriptions. One of my favorites is the description for the item that WE know is a Football trophy, but the Steambots think is something entirely different. I am not going to spoil the joke because I think it has to be discovered to be appreciated. Liked: I enjoyed the fairly epic story, the gun ricochet physics, the ease of learning the mechanics, the upgrading mechanics, and the over-all style of the game. Oh! I have not really mentioned some of the items that can be used to add area of effect damage, buffing, or healing. Those come into play and are somewhat optional. Hated: There are no StreetPass elements and there is no real variation in the Skill Tree. Also, the level cap is too low, I think. Oh! Performance on the original 3DS units is slightly diminished in comparison to the New 3DS units as this game is optimized for the New 3DS. These are your new best friends. This is an insanely gorgeous game with a ton of great little details in the backgrounds, foregrounds, and characters. The game is chock full of great and interesting robots. The 3D design is great and the band that shows up in the soundtrack is also visually represented in the game in a fun way. The design of the areas are distinct and the game has some really good dynamic lighting, steam effects, and just a very visually appealing look to it. The character animation and idle animation are pretty detailed as well. When aiming, your characters will close one of their eyes to focus their shots. There are also little words that pop over the characters after each turn. The game uses a "no firing" icon above the movement lines to illustrate what you can do on those actions. This is good because it helps people who have specific kinds of color blindness to also enjoy the game. Please enjoy these screenshots of the game and keep in mind that there is all sorts of movement happening during gameplay as well. The game runs at a steady 60 frames per second on the New Nintendo 3DS, even when the 3D option is being used. That is how we do it. Look at that bottom map. The red icons are ENEMIES. Just think about that for a moment. Liked: This game is just a beauty to behold, dripping with style and detail. Also, you have "free range" of the camera for the most part and it allows you to set up your shots fairly easily. The tons of great hats that are available are pretty great. The SWEETEST thing is the bit of deliberate slow motion when you make a particularly great kill shot. Hated: To be honest, there could be a little more motion to the maps and backgrounds. The game will slow down to dramatically tell you that the bullet heading toward your bespectacled scientist robot will, in fact, turn her into a pile of scrap. That little bit of salt hurts. It works well, but it really makes me cringe to see a perfect score ruined by a turret I forgot was there. The music in this game contains a ton of Filk songs with lyrics from the band Steam Powered Giraffe and some really great musical numbers by Johannes Hedberg, who some people may know from the group "Carbon Based Lifeforms." There are also some interesting samples, licensed "olde timey" musical numbers, and really good sound effects and folly work. The non-vocalized music works well with the gameplay and creates a unique and interesting atmosphere. The theme when you run into an enemy is appropriately tense and the sound made when a bullet tears through an enemy causing them to explode into a ton of parts is incredibly satisfying. Liked: I love the full musical numbers and the music. Since I am already a big fan of Filk music, I should probably take a moment to explain what Filk music IS and why I enjoy it. The sub-genre of Filk music is Folk Music combined with Fantasy or Science Fiction related lyrics. This could be something like a lovely ballad composed on guitar and traditional acoustic instruments that talks about a Zombie War in Middle Earth. In the case of this game, the music is talking about events that happen or will happen inside the game world. Often the lyrics in Filk songs will borrow from science fiction franchises like Star Wars or fantasy epics like The Wheel of Time. Filk music may also contain references to horror genre products or general pop culture icons like the Back To the Future franchise or Ghostbusters. Hated: If you are not a fan of Filk Music or SteamPunk, you might not like the songs? Eh. I hate nothing about the this games music and I applaud every one involved in making the inspired musical choices. The game has all sorts of accommodations for both the 3DS and New 3DS consoles. Being able to use the C-Stick on the New 3DS for the camera controls is a pretty great addition. Sadly, ZR and ZL do not do anything, but that would be besides the point. I would like the ability to tap them and see a clear view of the bottom map or have a "turn redo" option. This game is the most perfectly balanced title that Image & Form has ever put out. It has enough challenge for the casual and elite players with five difficulty levels and easy to learn mechanics. A 2D Strategy Role Playing Game with Steam Powered Robots living "Firefly" style around the remains of an exploded Earth that are fighting against the forces of evil is pretty unusual. When you realize that the game is about the preservation of freedom and individuality against forces that would shackle that freedom through horrific means, it becomes even better. The storyline just keeps escalating and even has smaller sub plots with the Non-Playable Characters that are interesting to track. This game just works on a number of levels and I really enjoyed it. It took me a few extra days to finish my review because I beat the game and discovered a New Game + option. This meant I certainly had to dive back into the game. I maxed out the character levels on my first play through and I am currently working on doing that again. The level cap is 10, which seems to be artificially low for a game as long as SteamWorld Heist ultimately becomes. Liked: Everything works here and this game provides a solid experience that is worth the money put into it. When I garner the value of a game, I look at it in terms of hours I have spent on the game. At the time of this review, the title is $19.99 USD. I divide that by the current (2015) minimum wage in the United States, which is $7.25 an hour. To be worth the monetary investment, this game should provide at least 2 to 3 hours of solid gameplay. This is a game that exceeds that value proposition by several times and I will continue to play this game long after this review. I also like that there are options to fast forward movement phases in the game, which is a good option for speed runners. The fact that many level maps are procedurally generated adds even more spice to this already savory dish. Hated: I do not like the level cap and I would like an even harder mode than Elite. I would add more animation to the map screen and also have an "Iron Voyage" mode. In this Iron Voyage mode, I would raise the level cap to 20 with all the new bonuses being additions to Health/Power/Movement. Then I would have something akin to "perma-death" in that losing any character that is not Piper results in you having to rehire them for an ever increasing amount of water. Also, this mode would have a maximum amount of characters per mission and not a minimum. This would allow you to take on a boss level, completely alone, to really test your skill. I would also like a Jukebox and Movie mode that allowed me to listen to the sweet music in the game in a playlist and also rewatch those interesting little movies between "chapters." Maybe something so I could look at all of the descriptions of the items and hats I have collected over the course of the game in a specific save file. Maybe some extras like illustrations of early designs for the game. I just want more of this brilliant game. I would also like some kind of special feature to add sweet scanlines or olde timey "effects" to mission levels. Just because that would be a fun extra. Fire Emblem, Codename: S.T.E.A.M., Steampunk Aesthetics, Ogre Battle, Worms, Filk Music, and Billiards. 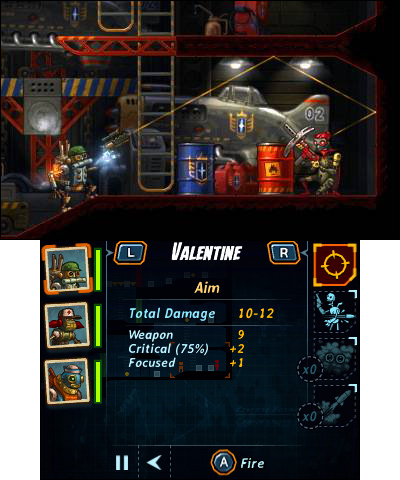 SteamWorld Heist is a brilliant combination of spare parts that has been constructed into a rewarding and challenging experience for fans of the turn based strategy game looking for something unique. Image & Form has delivered an impressive labor of love that I will continue to enjoy for some time to come. 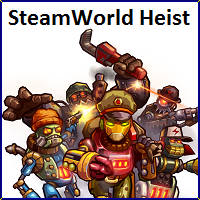 SteamWorld Heist is appropriately titled as it aims to steal your free time and it damn well succeeds.